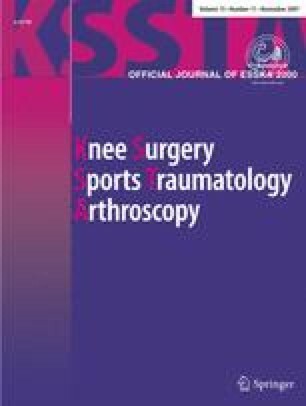 The aims of this study were to quantify the angle and placement of an anterior cruciate ligament (ACL) grafted with a single incision ACL reconstruction technique using postoperative magnetic resonance imaging (MRI), and to compare the results with those with a native ACL. Between February 1996 and May 2004, 96 consecutive patients, who had undergone postoperative MRI of the knee followed by an arthroscopically assisted ACL reconstruction with either a hamstring tendon or bone-patellar tendon-bone (BTB) autograft, were enrolled in this study. The femoral tunnel was drilled using the transtibial technique. The patients were divided into two groups; the hamstring tendon graft group (group H; 50 patients) and the BTB graft group (group B; 46 patients). All the patients including both groups in this study underwent postoperative MRI and were followed up for a minimum of 2 years. The control group (group C) consisted of 50 patients whose meniscus tear had been operated on by arthroscopy and whose ACL was intact. The orientation of the ACL ligament or graft was measured using three different methods: the sagittal ACL angle, the ACL-Blumensaat line angle, and the coronal ACL angle. The mean sagittal ACL angle in group C (58.7 ± 3.8°) was significantly lower than in groups H (64.6 ± 4.2°) and B (71.3 ± 6.0°). The mean ACL-Blumensaat line angle in group C (8.6 ± 3.6°) was also significantly lower than in groups H (12.8 ± 5.2°) and B (18.0 ± 5.3°). The mean coronal ACL angle in group C (65.9 ± 4.4°) was lower than that in groups H (73.5 ± 2.4°) and B (75.2 ± 2.9°). The grafted ACL of the hamstring tendon and BTB grafts on the postoperative MRI showed a significant vertical angle in the coronal and sagittal plane compared with the native ACL. In the sagittal plane, the hamstring tendon graft was positioned more obliquely than the BTB graft, which had a larger angle of the tibial tunnel, in an attempt to prevent a graft-tunnel mismatch. The postoperative MRI study showed that the more horizontally the angle of the tibial tunnel can be placed in a single incision ACL reconstruction, the more efficiently it can produce a graft closer to the native ACL.